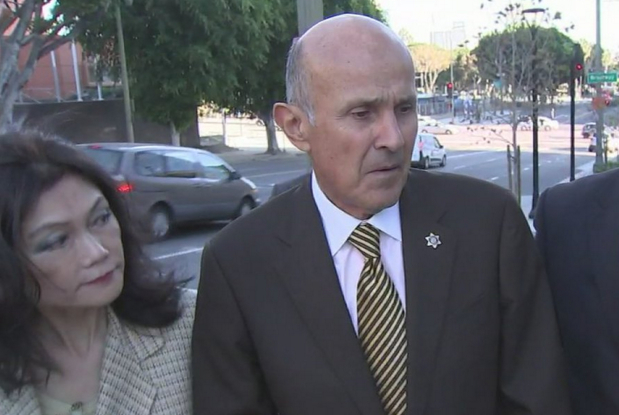 Former Los Angeles County Sheriff Lee Baca, who was convicted of overseeing a scheme designed to obstruct a federal investigation into corruption and civil rights abuses at county jail facilities, was sentenced May 12 to 36 months in federal prison. Baca, 74, who also was found guilty of lying to federal investigators, was sentenced by U.S. District Judge Percy Anderson. Anderson ordered Baca to begin serving his sentence by July 25. In addition to the prison term, the judge ordered Baca to pay a $7,500 fine. “Blind obedience to a corrupt culture has serious consequences,” the judge said. The sentencing follows a trial that ended in March when a federal jury convicted Baca on three felony counts: conspiracy to obstruct justice, obstruction of justice and making false statement to federal investigators. The evidence presented at trial showed that Baca was the top figure in the conspiracy, which also involved his right-hand man and deputies who implemented orders from the sheriff. The obstruction scheme began in August 2011 after LASD officials discovered a cell phone in an inmate’s cell at the Men’s Central Jail, linked the phone to the FBI’s Civil Rights Squad, and learned that the inmate was an FBI informant. The cell phone had been smuggled into the jail by a corrupt deputy who took bribes. The FBI had developed the informant as part of an investigation into the county jail system, which for years had been the subject of allegations of inmate abuse and subsequent cover-ups. The evidence presented at trial showed that the sheriff wanted to avoid federal scrutiny of his troubled jails. As part of the scheme to obstruct justice, Baca ordered a criminal investigation of the FBI agents conducting the investigation, and he directed his underlings to conceal the informant from federal investigators. Over the course of approximately six weeks, members of the conspiracy then took a series of steps that successfully hid the informant from federal authorities, engaged in witness tampering in an effort to prevent information from being shared with federal authorities, and threatened to arrest the lead FBI agent on the case. When Baca watched a recording of his deputies confronting the FBI agent, he reacted by stating “it was the best laugh he had in some time,” prosecutors noted in their sentencing memorandum filed with the court. While Baca put his right-hand man, then-Undersheriff Paul Tanaka, in charge of the scheme, Baca participated in dozens of meetings and phone calls with members of the conspiracy and directed his deputies to approach the FBI agent. Baca participated in the scheme after being warned by a top deputy that the actions would amount to obstruction of justice. The case against Baca is the result of an investigation by the FBI and is one in a series of cases resulting from the investigation into county jail facilities in Downtown Los Angeles that has resulted in 21 convictions. Baca was the 10th member of the Sheriff’s Department convicted in the obstruction scheme. Tanaka, who was also found guilty by a federal jury, was sentenced last year to five years in federal prison and is serving his sentence in Colorado. At last week’s sentencing hearing, Anderson said Baca would have received a sentence as long as Tanaka’s, except for his medical condition and the former sheriff’s lengthy history of public service. Eleven other former deputies have been convicted of federal charges, mostly related to unprovoked beatings of inmates and subsequent cover-ups. Baca and defense attorney Nathan Hochman vowed to appeal even before the sentence was handed down. Hochman, who supported home detention and community service, argued that jurors were barred from hearing evidence favorable to Baca and were not told that Baca has been diagnosed with Alzheimer’s disease.